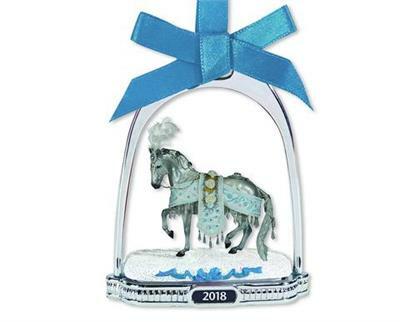 Breyer’s 2018 Stirrup Ornament features a finely-detailed miniature of the 2018 Holiday Horse, “Celestine.” She is framed inside a classic silver-tone stirrup that has a crystal snowflake dangling from its top. This glittering ornament hangs from a blue ribbon, and is the perfect accompaniment to the 2018 Holiday Horse! Jack's Country Store is a Blue Ribbon Level Breyer Model Horse dealer. We have been stocking Breyer models since 1994. All of our Breyer Models and Accessories are sold brand new, in original, un-opened packages. Most orders ship in 1-2 business days. Majestic in nature and always a joy to behold, draft horses take center stage on this year's Artist Signature Ornament. Inspired by Breyer models, artist Sheryl Leisure created two paintings for the double-sided frosted glass ornament.